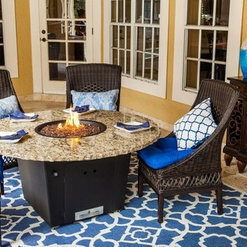 Whether you’re cooking sirloins with the family or unwinding with a glass of cabernet sauvignon, our “Firetaining” centers will undoubtedly become the heart of your home. 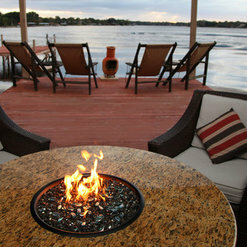 Each of our all-season fire pit tables are handcrafted in the USA from the finest materials and are ANSI certified. 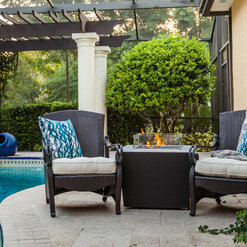 Firetainment Inc, headquartered in Orlando, FL, is recognized throughout the casual furniture marketplace for being the outdoor fire product innovators, with a main focus on customer service, quality components, and design function. Our sophisticated, modern designs complement any outdoor space and can be designed for an even better custom fit. Select from one of our classic fire pit tables, or allow us to personally design one to fit your entertaining and cooking needs. 12 Projects for Firetainment, Inc.
Hibachi Style Cooking at Home! 13 Reviews for Firetainment, Inc.
Firetainment is the best. Not only do they use nothing but the finest raw materials but they are the best value going. From top to bottom.... solid granite top, braided stainless steel hose, no rubber hoses to stainless steel adjustable feet. This table will last forever. The burner is unique to Firetainment and projects a flame like a real wood fire without the hassle. I can use it on my wood deck without fear of sparks. The added wind guard does a lot more than serve as a wind guard, in the dark of night it reflects the bouncing light of the flames to add to the beauty and natural appearance of the flame. The icing on the cake is the cooking package. The Himalayan salt blocks are a lot of fun. I have found tons of recipes on the internet.... they are easy too. Thank you Firetainment....you are simply the best! Firetainment has a wonderful product with great customer service! All of the different features from the high quality finish & granite to the ability to connect to natural gas line or just a regular propane tank make this product ideal for any outdoor setting. The cooking package is just the “icing on the cake” and allows you to get so much more use than just a fire table out of this one product. 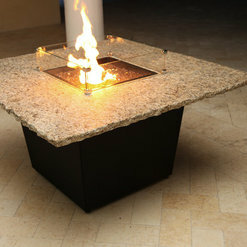 This fire table will be the center of many great gatherings and conversations! I highly recommend Firetainment to anyone who is wanting something unique and functional. 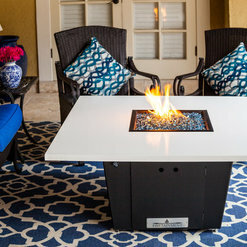 Firetainment is a unique firetable that offers versatility for cooking, relaxing and enjoying the beautiful table with the lid for a cocktail table. 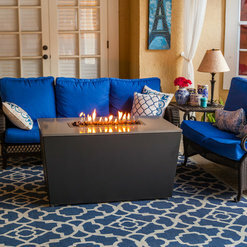 If you are looking to create some memories outside this season with your friends and family this is the firetable that would be a great choice! Many custom options to create a look that is all your own. The best part the quality of all the components from top to bottom. 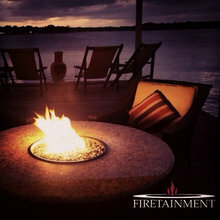 Firetainment is a must this outdoor season!! 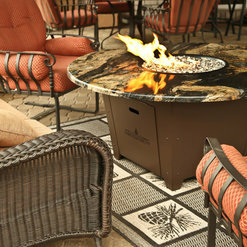 I absolutely LOVE Firetainment's Fire pit table! It's ideal for all occasions, all year long! It's a high quality product that's perfect for hosting parties, or even just a quiet night in. I've been using Firetainment tables for two years now. The tables are both functionally and aesthetically appealing. The materials and craftsmanship also shows in their product. I always get great feedback from my guests too. Most of all, I appreciate Firetainment's commitment to our community. At nearly gala and charity event I attend, I can count on Firetainment to help the worthy cause. It's without hesitation that I recommend Firetainment and its products. A quality product that is stylish and the envy of the neighborhood. 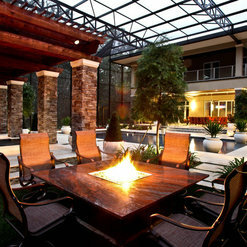 I love the modern look of these tables and the fire is mesmerizing. Being able to enjoy a dinner; wine or even s'mores while being outside makes being with friends and family more special. 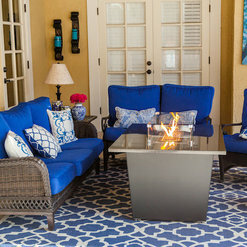 We purchased our Firetainment Fire Pit Table in March 2013. We purchased the Lazy Susan and Cooking Package so that we can convert the Fire Pit Table to a Patio Table or Hibachi Grill. In the Summer, we use it as a table in our pool area. In the evenings and Fall/Winter we use it for Fire and Cooking. 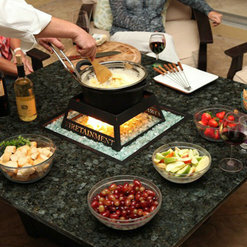 Our kids love using the Salt Block and Fondue Set-up. 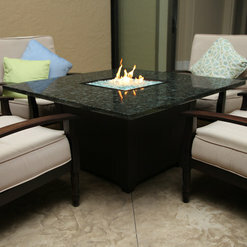 We spend about 3-4 days a week using our Firetainment Fire Pit Table! These tables are gorgeous....of the highest quality AND most importantly MADE IN AMERICA! 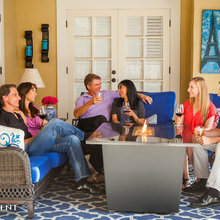 We LOVE entertaining family and friends...it's the center of attention! Wine, food, FIRE, and friends...doesn't get much better than that! 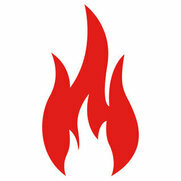 2 Ideabooks for Firetainment, Inc.